With Toma and Randy arriving, we sat down and mapped up a great itinerary for their two weeks on board La Mischief, weather and boat bits withstanding. To start off, we hired a car and picked them up from Dalyan Airport, about 30kms from Gocek. Airports on the Turkish coast are always an issue, so Gocek was a great place for a pickup. Bad news about the drop-off in Kas though as this was a 2 hour trip in a taxi. After a dingy ride to the boat, it was time to unpack. Me too, as Toma had kindly brought my new laptop and camera with her to replace the ones lost in the robbery. A swim and an intro into Hendrik’s G&Ts with cucumbers, and it was time to hit the town for a meal and Mojitos. Next day, we still had the car until 3pm so off we trotted to the Dalyan River. What a pleasant little spot that was, but the half day we had there was a little short. 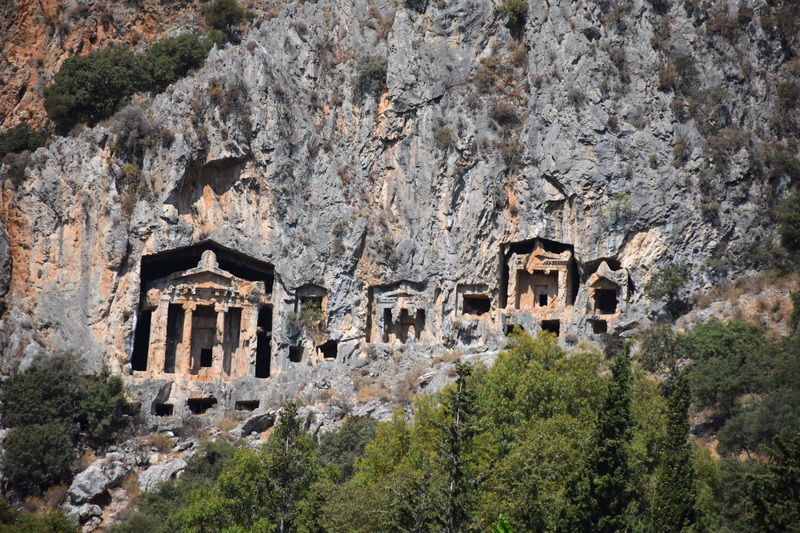 We took the obligatory riverboat trip past all the incredibly impressive Lycian tombs, perched half way up the sheer cliff walls. The boat dropped us off up the river and we had a short 15 minute walk up to some very impressive roman ruins at Caunos, with a nice Amphitheatre and a delightful little port area that is now several miles inland. It was a great couple of hours – given we didn’t have time to do the half day full river-cruise down to the mouth of The River to see the turtle sanctuary. We used what little extra time we had to have a really nice lunch at a riverside restaurant (one of the many) and the girls somehow managed to get in a bit of shopping time. Well that not quite entirely fair as Randy and I also managed to peruse some knock off watches – the usual Rolexes etc. Back on the boat, it was time to hit the water and head for Wall Bay. We’d noticed a problem with reversing on our port engine previously and this made it really difficult to anchor and back into the shoreline to tie back to the rocks. We eventually managed it, getting Randy to swim the lines in to the bollards amongst the tree-lined shore. Its one of our favourite spots and we had a great swim off the back of the boat in beautiful clear water as turtles popped their heads up from time to time. Next morning we did a longer swim to the Roman ruins that were half-submerged in – you guessed it – Ruin Bay, which was just around the corner from Wall Bay. When we got back to the boat I wasn’t entirely happy with how we were anchored so we decided we would pull and reset our anchor. So off came the shoreline and up came the anchor. Or not. The anchor winch refused to budge. We tried the winch handle in it and it still wouldn’t shift. Bugger. After 10 minutes of fiddling around, we realised there was only one thing for it – I needed to get Randy to pull it up by hand – Unfortunately Randy didn’t have the strength of two men so both of us had to work together to get the 70m of chain (in 20-30m of water) with the 25kg of anchor into the chain. locker. With the two of us pulling and Toma guiding it into the chain locker it took a good 40 minutes of maximum exertion to get it all up. Then Dee had a wonderful suggestion. Spying the restaurant with its yacht jetty across the way, we decided we could tie up there without either an anchor or a port engine in reverse. Jackpot. 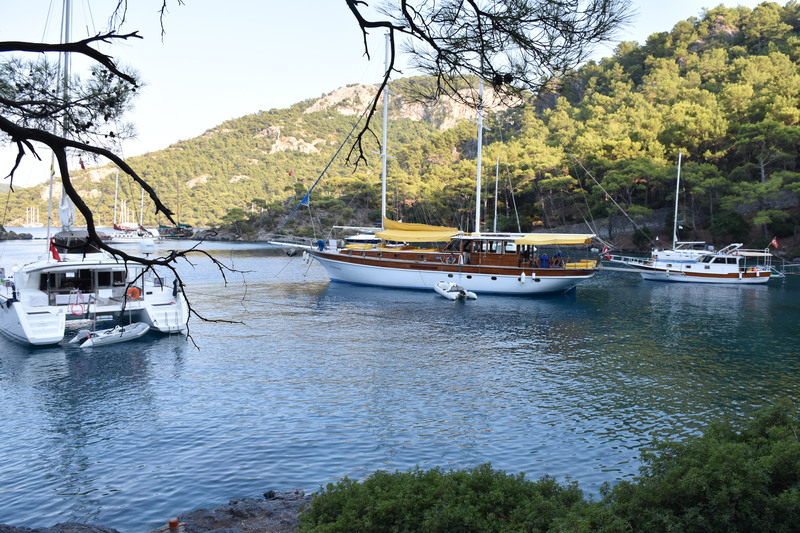 Next morning it was back to Gocek and Skopea Marina. Skopea recommended that we contact Sanli from Modayacht, which turned out to be an inspired suggestion. Whilst Sanli (and I) got to work, the rest of the crew took the opportunity to hire another car for the day and head for Saklikent Gorge for some sightseeing rather than hanging around a catamaran in various states of disrepair. Sanli got to the nub of the problem fairly quickly – it had a bit of a Mark “Jacko” Jackson look about it with a number of damaged and missing teeth in the gear box. The anchor winch was from Quick in Italy and I quickly found out that they don’t supply spare parts for their windlasses – only whole replacement units. I took the opportunity to swap over to a larger 1500W Lofrans windlass (from one of the 10 or so chanderlies in Gocek) that does have an ample supply of spares should I have a future problem. Next problem was the engine and this turned out to be an old favourite for the SD50 saildrive – whose cone clutches need to be replaced every 600 hours. Wow. Lots of chat on the internet forums about this. Next time this happens I am going to look at replacing these with SD60 saildrives that have a more conventional long-lasting clutch. This is also where I discovered that the Yanmar agent in Marmaris that we had to deal with was a bit of a card shark – Sanli filled me in on the fact that he was the cousin of the main agent in Instabul. I had to sell one of my grandmothers to buy two replacement cone drives and the cost of the oil was equally as exorbitant. Whilst we waited for the parts to arrive, we headed across to Fethiye to allow Dee, Randy and Tomia a visit to the old traditional Hamam to experience a Turkish massage, and to visit one of our favourite restaurants in Pasha Kebab (first discovered by Ewa). Back in Gocek the next day, we fitted our new cone drives and were on our way. This entry was posted in Turkey and tagged caunos, dalyan river, SD50, windlass by stull61. Bookmark the permalink. Anywhere else on the internet is confusing, and or wrong. I have been there.. Especially some old codger who tries to make you read his blog and drip feeds information, but evidently not from firsthand experience… E.g. undo the nut with a wrench!!! Ahhh not so simple old timer…. * Also the female cone glazes so just changing the cone in only half the problem. * The job is about 2 hours work if you have the necessary tools to undo an incredibly tight nut on top of the cluster. I am the only one on the internet with on-board home-made tool to do it in the saloon. * If you don’t have the tools it’s about an hour each to get them out, then take them to a workshop with a vice. Undo the nut, lap the faces and back in. * If it takes longer than an hour to get the gears out of the gear box it is being done the wrong way. If anyone tells you they need to split the engine and gear box they don’t know what they are doing. will be an expensive job replacing the SD50s with 60’s. Thanks Fish – will know for next time.